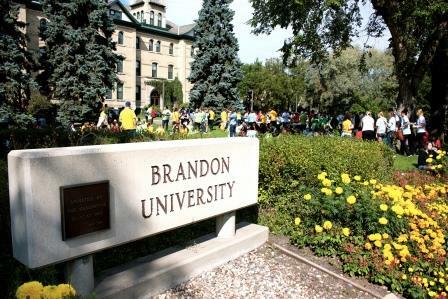 BRANDON, MB – Speeches, tours and 500 drums pounding in unison marked the start of Orientation today for freshman students at Brandon University (BU), a poignant time for both students and their parents. Drums were given to every student, parent and staff member to participate in a team-building session led by the international Drum Café group. For more than an hour, the Westman Centennial Auditorium reverberated with the primal beat of African drumming. Yarolsav Malishevskyy and his wife Nelya Malishevska moved to Brandon from the Ukraine four years ago and today accompanied their daughter Anna to Orientation. Nelya says this is a treasured day for the family and she baked a special cake for her daughter in commemoration. Yarolsav says the opening ceremony was surprising. “I expected more speeches,” he laughs. 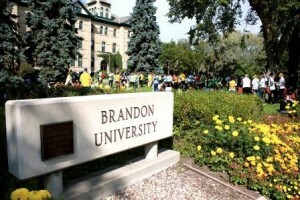 Through the first two weeks of September Orientation , students will enjoy a pancake breakfast, BBQ, dodge-ball tournament, tipi raising, two socials organized by the Students’ Union, trivia and karaoke nights, learning skills workshops, information sessions, and the Rock The Block street festival.